Every project is an opportunity for fresh ideas. Enter Studio Set. Thirteen hues selected to serve as your go-to source for colour in LVT. Studio Set is a spectrum of colours from super-saturated brights to ideal neutrals. Take note of the very subtle woodgrain pattern, but don’t get stuck in conventional solutions. These Skinny Planks™ were meant to inspire you to design with pure colour, creating unique compositions or just making a singular bold choice, like a red floor. Combine Studio Set with Interface carpet tiles side-by-side for an integrated flooring system of hard and soft tiles in Skinny Planks and squares. 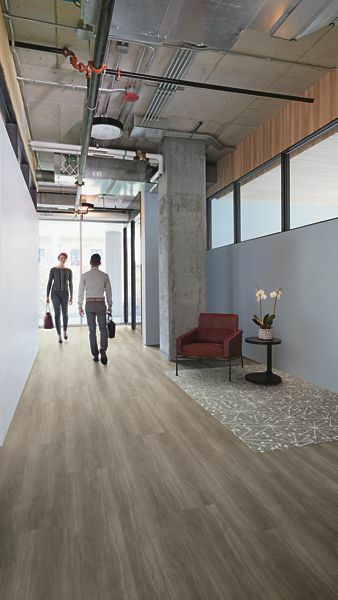 Interface modular floors allow you to move from surface to surface without the need for transition strips.